As we begin our new museum membership year, we’d like to remind everyone that membership dues are now due for 2017-2018. Dues are $25 for individuals, $50 for families, $500 for corporate membership and $1000 for corporate sponsorship. 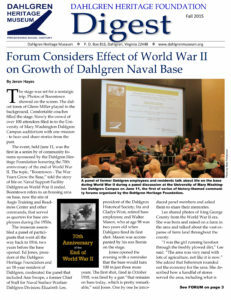 Please mail dues payable to Dahlgren Heritage Foundation, P.O. Box 816, Dahlgren, VA 22448, or visit www.dahlgrenmuseum.org to renew your membership. Please be sure to include your updated address and preferred email so we have the most current way to reach you. There are so many reasons why we love Dahlgren and King George County. This place has been and continues to be a center for world-changing technology, pace-setting engineering, aviation innovation, and has a community like no other. Become a museum member and help us share the amazing stories of Dahlgren and King George County that have helped shape our nation and inspire our future. It’s your choice: there are different kinds of memberships to choose from. If you do not want to join online, print THIS FORM and send it with a check or money order (please no cash). To join using our secure, online shopping cart, click the blue “add to cart” button below your membership choice.